There is an unwritten rule in this house that if you get back past a certain hour, that large dinners will not be cooked. My mother in law, in her infinite wisdom, says that if you have a bag of potatoes and a tray of eggs in your possession you’ll never go hungry. How wise she is. I’ve just finished making a quick potato soup and it was very, very tasty indeed. Just what I wanted and it was ready in less time that it would take to wait for a bag of chips in the local chipper. Although they do have a certain allure at this hour! It’s late on a Thursday evening. Well late for me anyway. At this stage I’d normally have the boys tucked up in bed, dinner would be cleared away and I’d be enjoying a quiet cup of tea. We’ve been a bit busy for the past 2 days though and they’re still running around the house like mad yokes as they both dozed off in the car in the late afternoon. I may have also had a sneaky nap while himself did all the driving. You could say that this meal has come at the perfect time because tomorrow is National Potato Day. We don’t need a reason to celebrate the potato in this house though. If you’re a regular reader of the blog, you’ll understand that I am a lifetime fan of the spud and if not, stick around and you’ll find out. I’ll pop a couple of links to my most popular and unusual potato recipes at the end of this post. Fingal is the market garden of Ireland and you will find many of the potatoes that make their way to our tables grown within the North Dublin area. This year, many of the producers are bringing the farm to you, so check out the definitive Potato Website to see what’s going on in your area. Special mention goes to Keogh’s Farm who will be in the South Kings Street Area of Dublin tomorrow, Sam’s Potatoes who will be in Temple Bar (and I understand, guests of the Sodshow this week) and Country Crest who are making an attempt at a Guinness World Record at their site in Lusk. Before I forget, Noel & Ingrid Dunne who are very local to me (I think if I threw a stone from my allotment it might land in one of their fields!) are the Tweeting Farmers this week. So back to the recipe for a quick potato soup. I timed myself and it takes 12 minutes to make. You don’t need a huge amount of skill, or loads of ingredients. This recipe serves 1 person, you can scale it up if you like but the potato won’t cook as quickly if you make the soup for more than 2 people in the pan. Take a large wide frying pan, put it on a high heat and pour in the water and crumble in 1/4 of a stock cube (just pour in the stock here otherwise). Bring to a rolling boil. Using a sharp knife, cut the potato into thin strips or tiny cubes about the size of your small fingernail. Drop into the boiling stock and stir a little. Boil for 8 minutes and the potato should begin to break up a bit which shows it’s cooked. The simmering stock will reduce also so you’ll get about half the volume you started with. 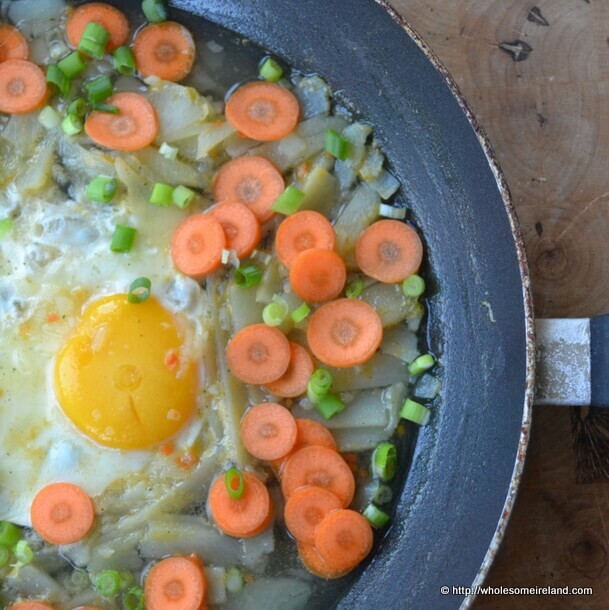 Turn the heat off and straight away crack the egg right into the middle of the pan on top of the hot stock. Slice the carrot and scallions into small pieces. After 3 minutes the egg will be cooked but the yolk still runny. Using a large spoon scoop up some of the stock and pour it over the top of the runny yolk. This will cook the top of the egg. Tumble the raw carrot and scallion over the stock and eat with a spoon. The use of a bib is optional but advisable. It makes the meal well rounded with a protein source as well as starchy carbohyrdate and vegetables. You could of course leave the egg out but it really adds to the flavour. While I love cooking and working in the kitchen there comes a stage when it is a chore and I’d rather be sitting down with a cup of tea in hand! Brilliant! I love a bit of egg as a protein punch. Makes it so easy! Thanks! 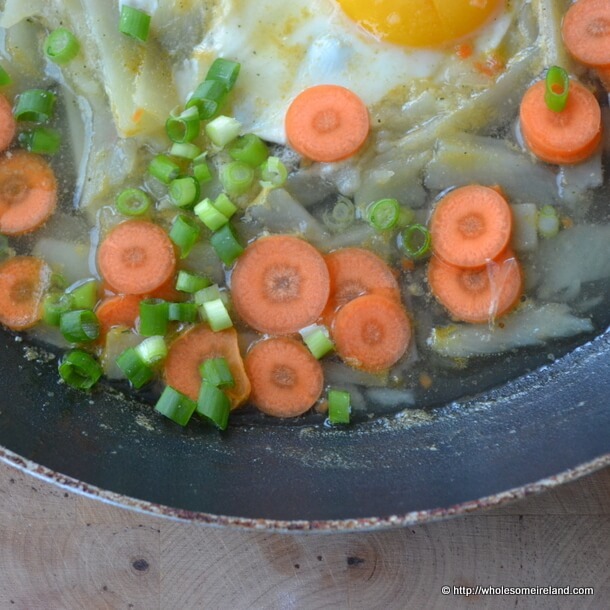 I love the way the egg thickens the soup a little and it really adds to the flavour. So Good. best lunch i have had in awhile. made a quick chapatti to go with it yummy. Delicious. I’m glad you enjoyed it!